The 3/4" wide by 36" USA landmark and paw print snap closure lanyards come with quick release buckles. You can snap on more than one attachment to one lanyard easily. You can choose swivel hooks, badge clips, badge straps, key rings, trigger hooks, heavy duty snap hooks, plastic swivel hooks, plastic rings, rubber rings (for holding water bottle neck), all at the same low pricing. You can even order our optional lobster claw hooks with key rings, trigger hooks with key rings, round gate rings or oval gate rings to add-on your lanyards for more applications. If you need a custom imprint, we have great imprinting option and fast delivery schedule available at factory direct low price! 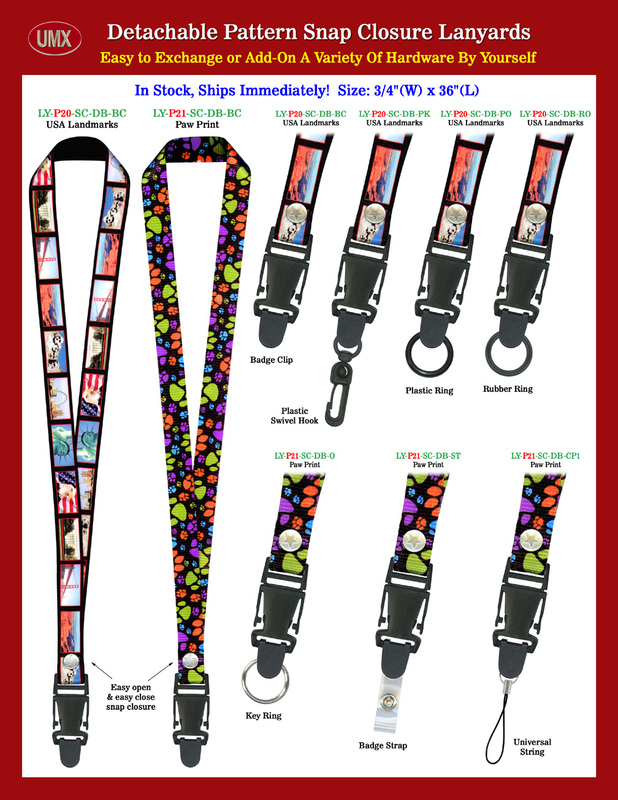 You are viewing Lanyards > Snap Closure > 3/4" Quick Release Snap Closure Lanyards with USA-Landmark and Paw-Print Themes.